CHARLESTON, S.C. (June 18, 2018) – A few months after the first ENPL social media toolkit was delivered to clubs competing in ENPL qualifiers, another social media toolkit has now been released to focus on providing resources ahead of the ENPL Eastern Playoffs, ENPL Western Playoffs and 19-U ENPL Finals – as well as the complementing NPL Finals events for boys competitors. The toolkit includes sample social media posts, suggested hashtags to engage with other participants and a Twitter directory. For ENPL events, @ENPLsoccer will be the primary Twitter outlet, while NPL events will be led by @USClubSoccerNPL – 280 characters at a time. Participating clubs and supporters are encouraged to support their qualifying competitions by tagging @USClubSoccerNPL and @BoysECNL. While viewing the toolkit on a mobile device, please use the mobile-friendly version, featuring clickable Twitter handles and automated tweets that can be shared directly from the toolkit. To print the toolkit, please use the non-clickable, printer-friendly version. 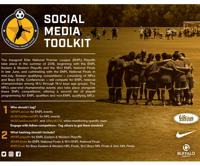 The ENPL social media toolkit not only benefits participating clubs by providing them with one location for social media resources, but also helps to unify members competing across the ENPL’s 16 NPL and Boys ECNL qualifying competitions.